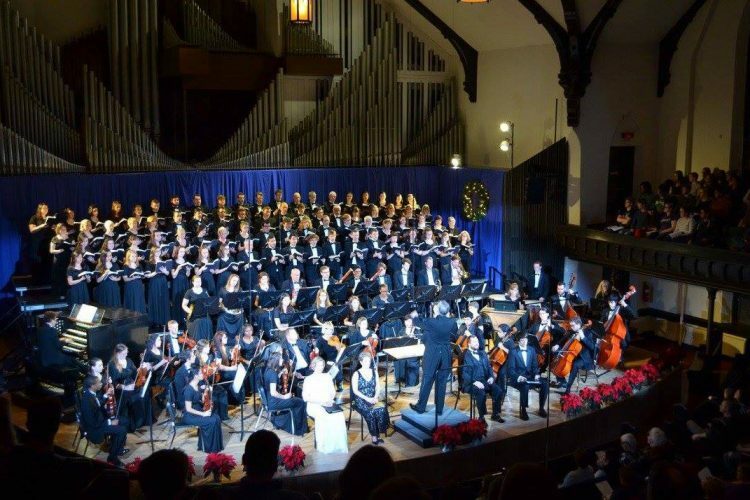 The Cornell College Department of Music will present “Make a Joyful Noise,” a holiday concert featuring the orchestra, choirs, and organ, at 7:30 p.m. on Saturday, Dec. 2, in King Chapel. Admission is free and the concert is open to the public. College organist Mark Baumann will play a 20-minute prelude prior to the start of the concert as audience members arrive. The Cornell College Orchestra, conducted by Music Professor Martin Hearne, will perform Mozart’s Symphony No. 32, as well as works by Prokofiev, Bizet, and Mussorgsky. The Chamber Singers and Concert Choir, conducted by Music Professor Lisa Hearne, will perform a variety of works together and separately, including a Kenyan folk song and seasonal motets. The combined choirs and orchestra will perform “Make a Joyful Noise” by English composer Edward Gregson, “Jornadas,” a colorful set of Spanish carols by Gary Fry, “Jesu Joy of Man’s Desiring” by J.S. Bach, and “Glow” by Eric Whitacre.